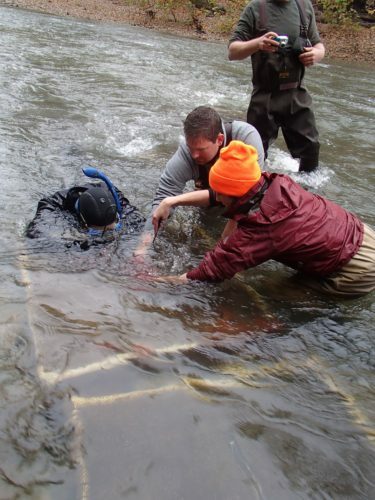 Hellbender release – Purdue biologists help a release attendee place a Hellbender in its temporary holding pen. Photo credit: Marci Skelton. The Hellbender salamander is North America’s largest salamander. It is fully aquatic, living its entire life in rivers and streams throughout the midwest and southeast. Hellbenders require cool, clean rivers and streams with rocky substrates to thrive and reproduce. Unfortunately, over the past several decades the species has declined or disappeared from many of these areas. In Indiana, the species can only be found in the Blue River in south-central Indiana where there remains only a very small, geriatric population incapable of sustaining itself. In order to save the species in the state, Purdue University and its many partners have joined together to reverse the decline. On November 1st and 2nd of this year, Purdue FNR’s Williams lab released 80, 4-year old Hellbenders into a site chosen as the best Hellbender habitat in the Blue River. Members from Purdue University, Mesker Park Zoo and Botanic Garden, Columbian Park Zoo, Fort Wayne Children’s Zoo, Indianapolis Zoo, the Indiana Department of Natural Resources, the Indiana Department of Environmental Management, Duke Energy, and more all helped in the task of releasing the individuals into their new homes. In order to document success, all 80 Hellbenders were implanted with radio-transmitters. These transmitters emit a signal that allows biologists to detect them with antennae and locate the exact location an individual is hiding. For the next six to ten months, through rain, snow, and shine, Purdue biologists will follow these animals to document their behavior, habitat preferences, and whether or not they survive life in the wild. Transporting Hellbenders – Release attendees work together to transport Hellbenders across the river to be processed before release. Photo credit: Marci Skelton. The outcomes of this study could help solve two major problems facing Hellbender conservation. The first is that the addition of Hellbenders into the system could help spur natural reproduction and help to start stabilizing the system. This small step is important towards our eventual goal of repopulating the Blue River and other former Hellbender streams. The second problem this study will hopefully address is the issue of poor survival of captive-reared animals when released into the wild. If we find that raising animals in more natural conditions improves survival over those raised in the more common no-flow conditions, this technique could be easily adopted at captive-rearing facilities throughout the nation and help increase the overall success of Hellbender conservation in the United States. For more information, please visit HelptheHellbender.org.